Firstly, decide you have to prepare for crushing disappointment, so spend the two weeks over-analysing everyone’s tone of voice and body language and conclude that it is unlikely you won anything. Then spend the next week stopping yourself from ringing or emailing the co-convenor and begging her for a clue. Make yourself thoroughly miserable in the few days preceding the event, and seriously consider not going. Vow never to enter another competition. Go to the event because you have invited your mother to keep her amused (after recent family tragedy). Have fun talking to other authors. Listen to all the names being called until they have run out of commended, then feel like an idiot (and extremely delighted) when they call your name for a really great award!!! 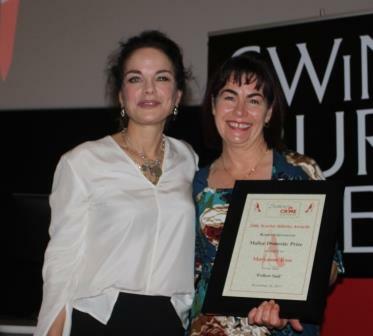 Michaela Lobb [the Scarlet Stiletto Awards wrangler} was so encouraging about ‘just being shortlisted is great!’ and Lindy Cameron didn’t seem to know which story it was when we chatted at the Ballarat Writers’ Festival. I’m very gullible :). Told my mother I wouldn’t win anything but she might enjoy the night!! Had a great surprise and really loved meeting/reconnecting with the other authors. It’s great that you create a new mini- community every year. Love the stories in the Ninth Cut. Hopefully this is all just good practice for the Miles Franklin / Booker etc!!! Thanks for a very well run and enjoyable night. Maryanne Ross won the Kerry Greenwood Malice Domestic Award ($750) for her story “Follow Suit”.